These devices give extra protection in the event of an earth leakage fault on any of your electrical circuits. They are very sensitive and will trip your electricity supply and switch it off. They work by detecting very small quantities of earth leakage(that is, current flowing down the earth cable which it shouldn't). They do this by measuring any differences between current flowing in the live cable and current flowing in the neutral. This should be the same but if the difference is greater than 30 milliamps then they trip out your supply. Some appliances will have very small amounts of background leakage. As they age or become faulty the leakage may increase. Other causes of leakage can be water of dampness. 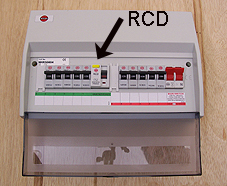 - RCD's may form part of the consumer unit, in which case they may also be integral with the main isolating switch. - RCD's may be self contained units that you can add to individual circuits. For new installations the current electricity regulations stipulate that RCD's must be used in certain areas. e.g. 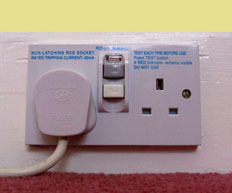 with any socket outlet that may be used for electrical equipment in the garden. 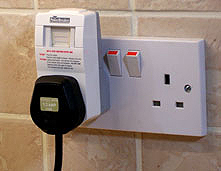 Split load consumer unit. Half is RCD protected.